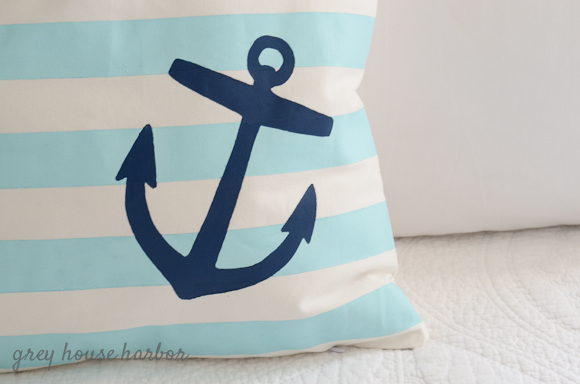 While looking for decorative pillows for Songbird’s bed, I came across this adorable anchor design. But $52 for a 20″x 20″ pillow?! I didn’t like it that much. Naturally I decided to make it myself. 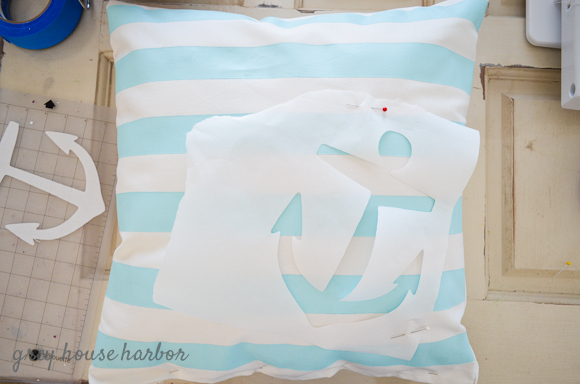 I already had an unused throw pillow insert and white fabric left over from another project. Since I was sewing my own pillow, I cut two squares of fabric to size first. 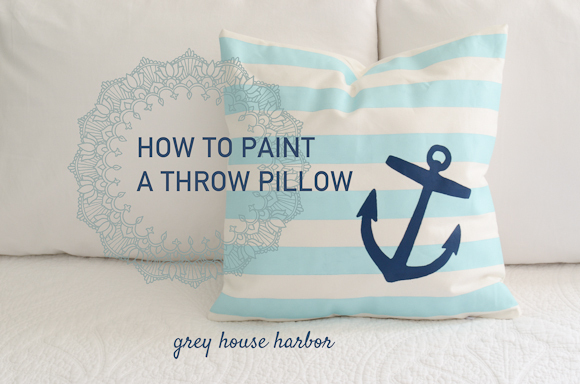 However, this technique can still work if you’re starting with a pre-sewn pillow cover. 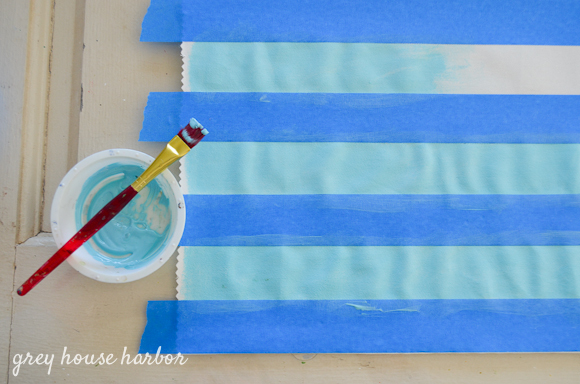 To make the stripes, I used plain ‘ole painters tape. Since the tape was already 2″ thick, I just used a small piece of it as a spacer to mark off equidistant stripes. 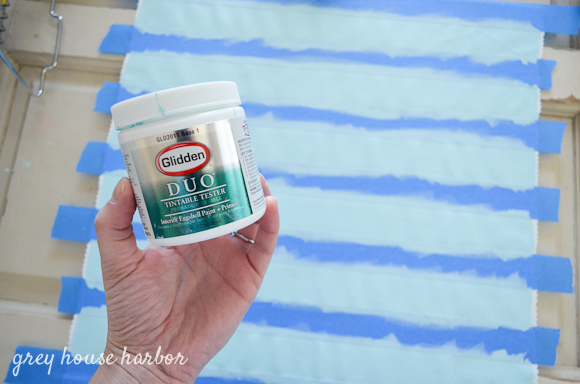 Did you know you can paint fabric with latex house paint? True story. When dry, the paint is flexible and feels smooth. Since I wanted the colors to match what I had already used in Songbird’s room, I got out the sample-sized tester jars that I used for her ombre scalloped wall. Apply 2-3 coats with a small brush. 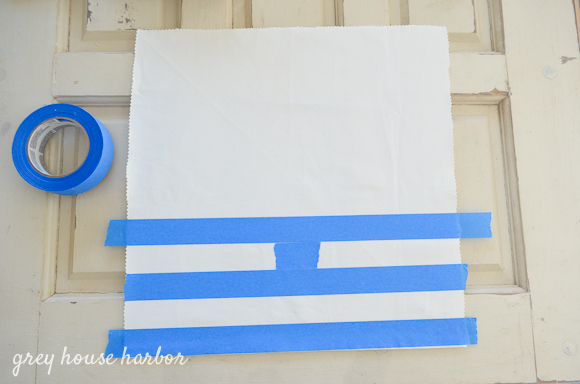 Once the stripes were dry, I cut the anchor shape out of freezer paper (tutorial here). To make sure the stencil was properly positioned when the pillow was full, I sewed the pillow on 3 sides and slid in the insert. Then I pinned it in place. To protect my iron from the stripe paint, I placed a piece of parchment paper on top of the stencil when I ironed it on. 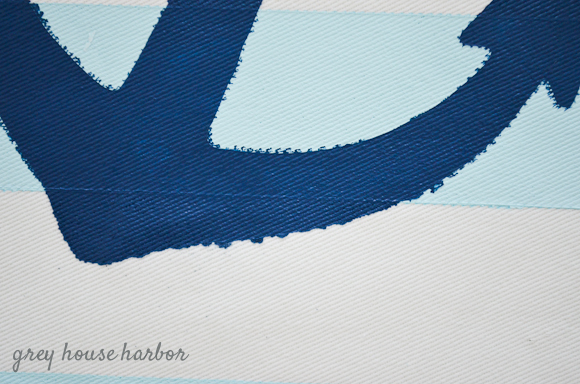 The stencil didn’t adhere very well my textured fabric, so I used a detail brush to clean up those edges. And because I am terrible at blind stitching by hand, I bought a zipper and finished the pillow that way. 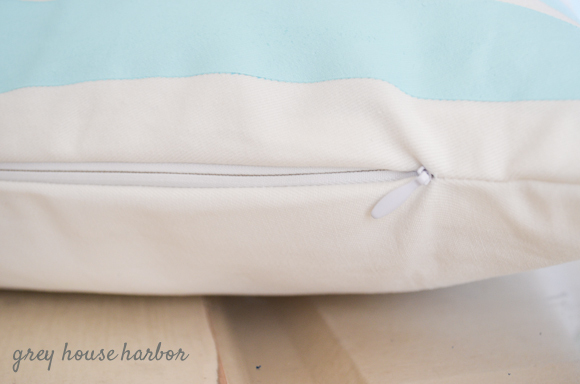 Ultimately, the zipper was my only cost for this awesome accent pillow – $3! Got exactly what I wanted for a price I can live with. *** Please keep in mind that latex house paint is NOT machine washable. 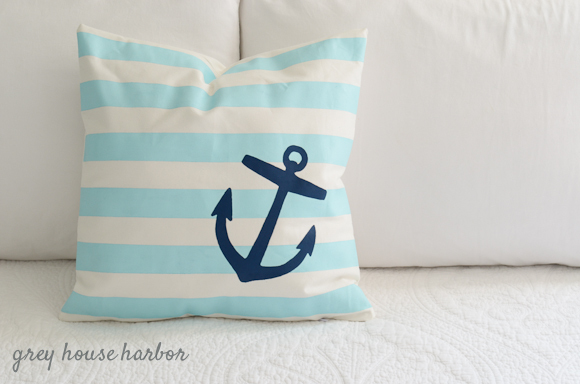 Since this is a decorative pillow I figured that wasn’t a big deal; I can spot wash it if needed. 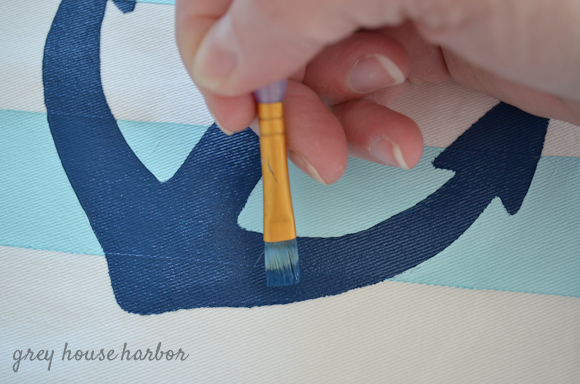 I recommend using fabric paint if you desire washability. So pretty! 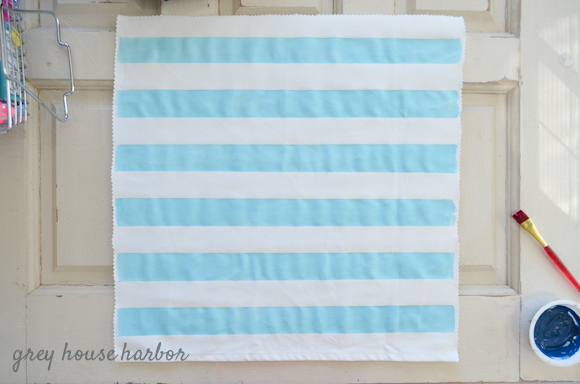 I’m getting ready to do something very similar with the stripes, have my fabric already cut and ready to go. I never thought of embellishing it further though…hmmm got me thinking now. 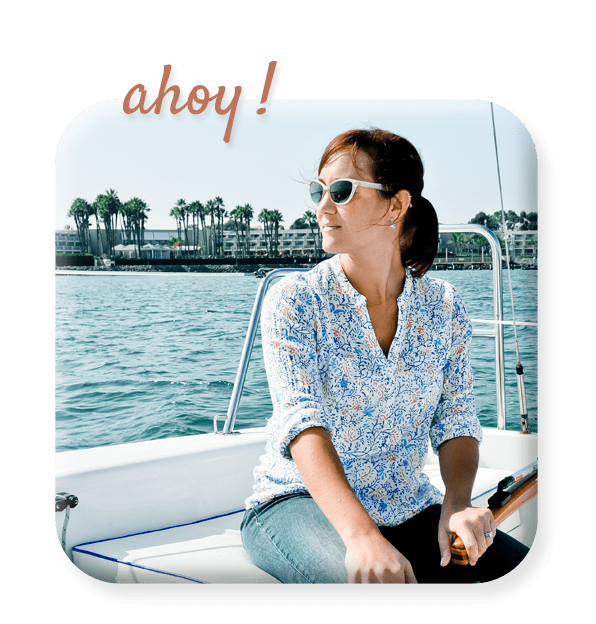 :) Definitely pinning!